Despite the rain, the opening of “BASQUIAT AND FRIENDS” by Roland Hagenberg on 7th November was a lively affair with a great turn out. The guests really appreciated the rare opportunity to meet Roland and to converse with him about his work, Basquiat, and New York in the 80's. Swing jazz music performed by Bert Amparado and Jason Cheng livened up the ambience, getting us into a dancing mood! The rain kept pouring on the next day while Roland giving a talk on "Basquiat’s New York: Capturing the mood of a bygone era". It didn’t douse our enthusiasm for Roland, Basquiat and New York, though: the room was filled to capacity. It was a precious event where the audience heard firsthand about what it was like being a part of the 80's New York art scene. They also learned more about Roland's various projects, such as the Stork House and Raiding Project with leading architects. All in all, it was an illuminating and inspiring talk. Click more to find out what you have missed and what's coming up next! The 6th Annual Luncheon of 'Reach for the HeART' at November 25th opened the charity program with a big hearty success, supported by all of you who joined us at the China Club. Warm feelings enveloping us all that day as we gathered in joy for a good cause. We were also honoured with Khandro Rinpoche's presence that day, sharing some wisdom through her short, impromptu talk. Sin Sin, Grace from Art in Hospital and our team would like to express our sincere gratitude for your continuous support and generous contributions. As always, your contribution is going towards providing free workshops and other art activities exclusively for elderly patients in public hospitals. It was a great honour to have a soulful evening at Sin Sin Fine Art blessed by the Female Spiritual Teacher Khandro Rinpoche. She opened the evening with a guided meditation, followed it with a talk on The Feminine Principle in Buddhism. A short film from Dakini land was shown, where healing spirit medicine was made from the essence of the feminine. The talented dancer LiAnne Hunt performed a Sacred feminine Vajra Dance to close the evening. YES! We extend the exhibition until 8th December. Sin Sin Atelier delightfully bringing you the Charity Jewellery show of gorgeous one-of-a-kind jewellery by many celebrated designers to benefit Art in Hospital! A perfect time to get fabulous gifts for your loved ones. A good excuse to pamper yourself while supporting a good cause too! A portion of the proceed goes to Reach for the HeART program, to provide free workshops and other art activities exclusively for elderly patients in public hospitals. Featuring exquisite black and white photographs by Roland Hagenberg, the “BASQUIAT AND FRIENDS” exhibition is shown at two venue: No.54 with photographs of Basquiat in intimate and honest settings, and at No.53 with photographs of other iconic artists during that era wo were friends of Basquiat, such as Andy Warhol, Keith Haring, Julian Schnabel, Francesco Clemente, and Annie Leibovitz. In conjunction with the exhibition, a linen-bound book entitled “BASQUIAT” is especially published to further share the invaluable rare insight into Basquiat in his Crosby Street studio in the 80’s through black and white photographs and literary writing by Roland Hagenberg himself. There are numerous books available in the market with words about Basquiat’s dramatic life but there is no book like “BASQUIAT” in which Hagenberg photographed Jean-Michel Basquiat painting in his Crosby Street studio right before he fell under the spell of Andy Warhol. The book "BASQUIAT" is now available for purchase at Sin Sin Fine Art. HKAGW kicked off on Nov 26, the day we hosted our Charity Luncheon. As a member of HKAGA, we are excited to join “Soho & Sheung Wan Art Lates” on December 2nd. For art lovers, we know the night is never too late to appreciate art in all forms. There will be numerous exciting events through the whole week including pop-up exhibitions and nine opening receptions or gallery parties during the evening. Enjoy a special evening at Sin Sin Fine Art with Anam Thubten who will offer an experiential exploration of the enlightened feminine principle within Vajrayana Buddhism through poetry, dance, song, meditation and ritual feast offering. Please RSVP with Heather Kong at info@sinsinfineart.com. Ever wonder what the actual difference is between a chromogenic print and an inkjet print? Pigment vs Dye vs Dye Sub? Widerhall Fine-Art Photographic founder Jacqueline Furniss will discuss the differences of various contemporary print types with 50x microscopic images to demonstrate. She will also unveil other facts that contribute to image qualities, with hands on "looking" at different print types with 20x loops will be available after Q&A. When passionate souls meet the love for culture and craftsmanship, beauty and function; threads of lives are interwoven, manifest in works that are beautiful in many senses of the word. A select group of contemporary visual artists share their small yet significant stories, focusing on the smaller things that often go unnoticed but hold an integral part in degining personal and cultural identity. 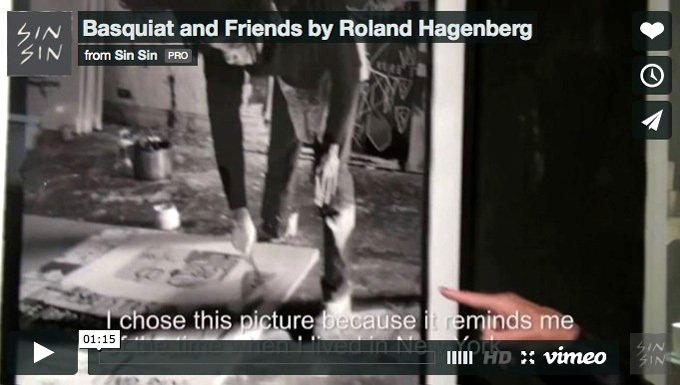 While Roland Hagenberg’s photo-portraits of Jean-Michel Basquiat and other New York artists of the 80s are on view at Sin Sin Fine Art - the Tokyo based writer and photographer is putting the final touch on his new poetry book. It will be published next year together with drawings and illustrations by Roland. Encouraging words came from Nobel prize winning writer Kenzaburo Oe, who joined Roland the other day at a lecture during Japanese star-architect Hiroshi Hara’s exhibition in Japan at the Ichihara Museum. The show features also a model of Hara’s sculpture “Three Travelers” – which was built in collaboration with Roland last October in Raiding, Austria – the birthplace of composer Franz Liszt. Photo caption: Nobel prize recipient Kenzaburo Oe and Roland Hagenberg. Miami Design Market (MDM) is a unique “urban” retail environment that will allow artists and designers and their boutique brands to showcase their products. This 4th to 7th of December, you will find Sin Sin Man’s iconic Cheongsam and Any Wear Bag shining at Miami during the Art Basel week. We are also launching a new series of “Protector” backpack there, featuring leather and super soft fur. You will have to see them by yourselves! During the months of November and December, 10% of sales proceed at Sin Sin Atelier will be donated to Art in Hospital to help expanding their art workshop programs to reach more elderly patients in need. Hindu Balinese posses a very rich repertoire of rituals covering many aspects of life. One of them is strongly related to the world of plants; it is about what nature provides for our life. "Tumpek Pengatang", or also known as "Tumpek Wariga" falls on Saturday, 22 November this year. The day will be devoted to the God manisfested in "Sangkara", who maintains the safety of all crops, ensuring their healthy growth to provide good harvest. The ceremony is also called "Tumpek Pengarah", which means 'notification' - to remind people that the main ceremony "Galungan" is exactly 25 days ahead from this day. The essence of this ritual is to remind all human beings to respect, to take care, to honour and to live in harmony with nature, especially with plants.